Feel like you’re drowning in email? Like it’s a never-ending issue too? Most of us are—yet we have to keep checking because it’s our primary way to communicate with our prospects and customers. But our inboxes are also filled with clutter. You make an online purchase and next thing you know you’re getting tons of promo emails. You donate money to a good cause and now hear from them weekly. You download an ebook and get added to that company’s list. Plus, we get spammed to death. 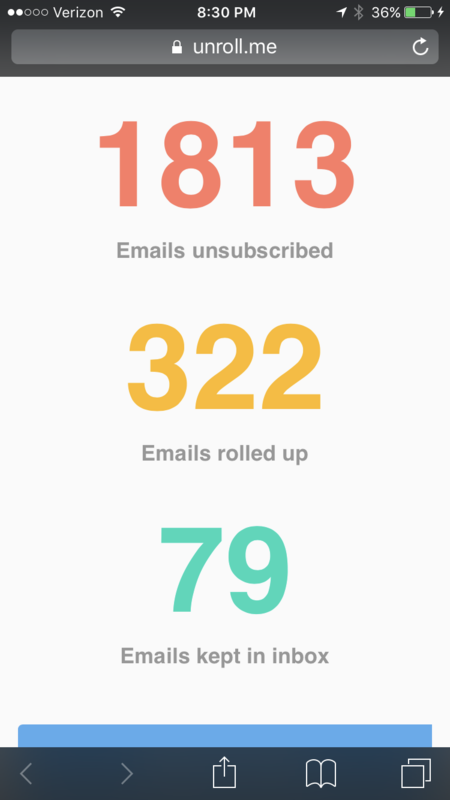 My life changed when I discovered Unroll.me. Every day, this app does two very important things. 1) It scans my inbox looking for new subscriptions, then sends me an email with a message like this at the top: We found 3 new subscriptions in your inbox. Why not roll them up or unsubscribe? When I click on the link, I get taken to their site where I can quickly decided what to do with them. If I chose unsubscribe, I never hear from that company/person again. If I select "Add to Rollup", then we go to the second nice capability of Unroll.me. 2. It sends me a daily roll-up of all the emails I want to keep reading. They don't clutter my inbox individually, but arrive in ONE message that I can quickly scan and make a decision about. In the 18 months that I've used this tool, I've unsubscribed from 1813 email newsletters. Assuming these companies contact me once a week, just think of all the time I'm saving. As you can see, I also have 322 emails that I've rolled up, which include messages from sales and technology companies, industry news, my favorite shopping spots and pet causes. But again, these subscriptions don't arrive individually. Every day they arrive in my inbox at the time of my choosing—all in one message. Do you realize the sheer amount of time I've saved in the last year? How about today? I've freed up time to do high value work, the kind that makes a significant difference in my success. I'm a lot less stressed too, which means I do better work. Check it out. Time is your most precious assset. Make sure you use yours well!